Q. I’m guessing St Ives was your first proper campaign? What did you learn from that? A. Being a circuit water you saw quite a few anglers. I had to put 100% in my fishing all the time. There were some very good anglers fishing it and they were on the ball, so if I wasn’t then they would capitalise. I would get up during the night and listen, just to put every ounce of effort I could in. Q. Do you do much research into a new venue before you arrive, or do you just prefer to scope it out yourself? A. I normally join a lake for a specific carp. I like to do as much research as possible. Through social media I like to get in to contact with like-minded people. I look back at times of the year or moon phases. I only fish weekends, but if a fish that I was fishing for came out on a certain moon phase, then I would book a holiday. I make notes all the time when I’m fishing. I will log sightings, captures, anything that will help me find out some sort of pattern. I have found that some fish like certain areas, so you can pin them down to certain spots. Q. 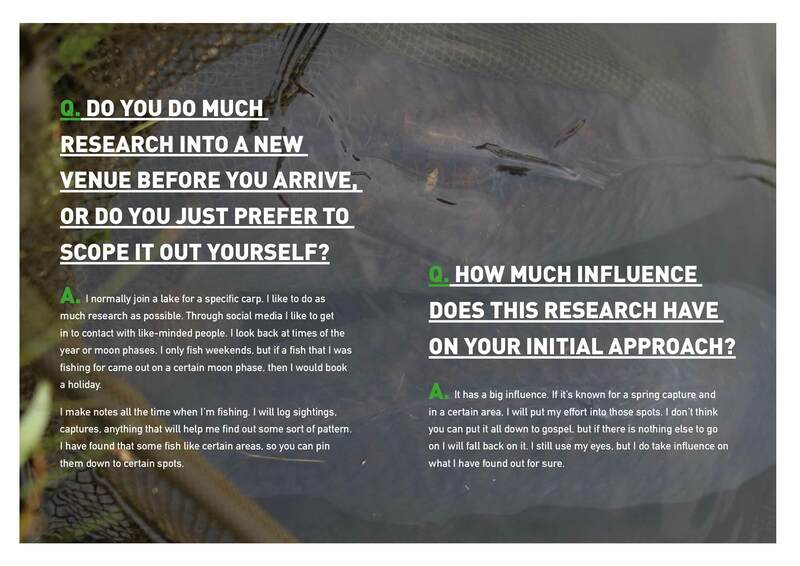 How much influence does this research have on your initial approach? A. It has a big influence. If it’s known for a spring capture and in a certain area, I will put my effort into those spots. I don’t think you can put it all down to gospel, but if there is nothing else to go on I will fall back on it. I still use my eyes, but I do take influence on what I have found out for sure. Q. What type of areas/spots do you look to target? A. I like really small spots. Those spots that may take a long time to find, especially in an area after you have seen them showing in the morning. If I have watched a display, I will wait for it to stop and them plumb the hell out of it. I am very persistent in spot finding and I will find something that they have been feeding on. If I get a firm drop on a clean bottom then I am happy. The smaller the spot the better, but it does take a lot of casting. 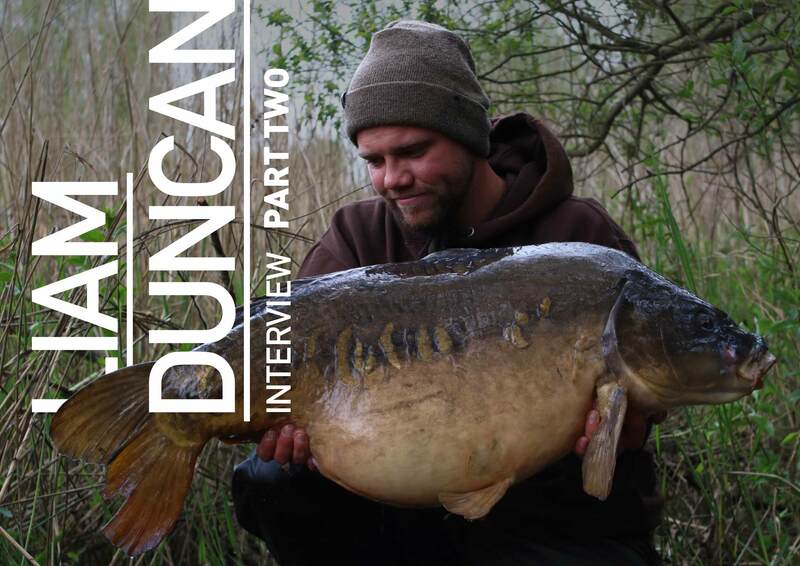 The Lincoln Lake taught me that – I had to be so particular on where the lead landed. Some have to fish chods because they don’t have the patience. Q. 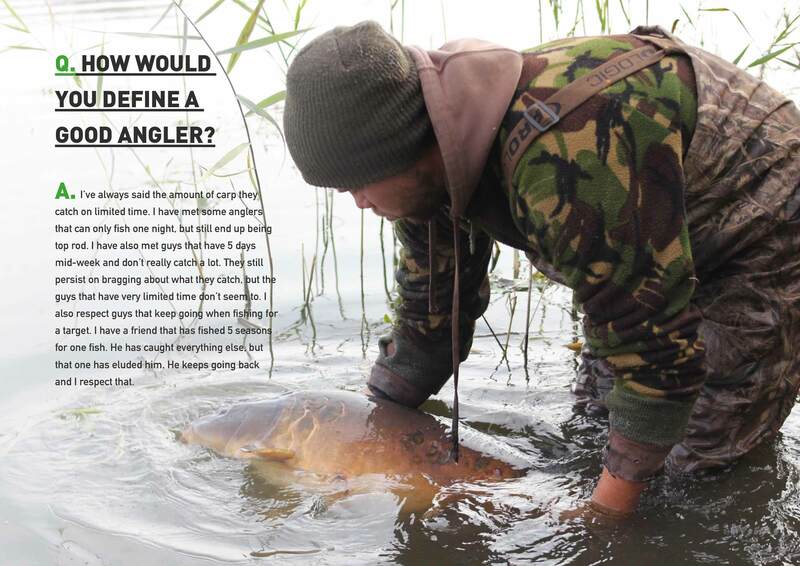 How would you define a good angler? A. I’ve always said the amount of carp they catch on limited time. I have met some anglers that can only fish one night, but still end up being top rod. I have also met guys that have 5 days mid-week and don’t really catch a lot. They still persist on bragging about what they catch, but the guys that have very limited time don’t seem to. I also respect guys that keep going when fishing for a target. I have a friend that has fished 5 seasons for one fish. He has caught everything else, but that one has eluded him. He keeps going back and I respect that. Q. 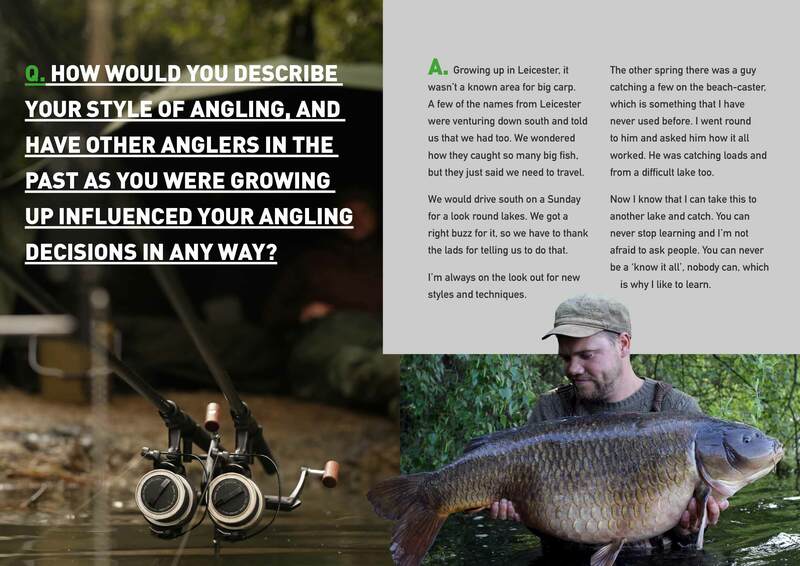 How would you describe your style of angling, and have other anglers in the past as you were growing up influenced your angling decisions in any way? A. 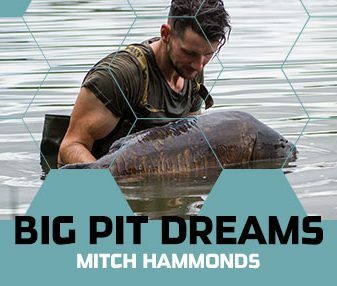 Growing up in Leicester, it wasn’t a known area for big carp. A few of the names from Leicester were venturing down south and told us that we had too. We wondered how they caught so many big fish, but they just said we need to travel. We would drive south on a Sunday for a look round lakes. We got a right buzz for it, so we have to thank the lads for telling us to do that. I’m always on the look out for new styles and techniques. The other spring there was a guy catching a few on the beach-caster, which is something that I have never used before. I went round to him and asked him how it all worked. He was catching loads and from a difficult lake too. Now I know that I can take this to another lake and catch. You can never stop learning and I’m not afraid to ask people. You can never be a ‘know it all’, nobody can, which is why I like to learn. 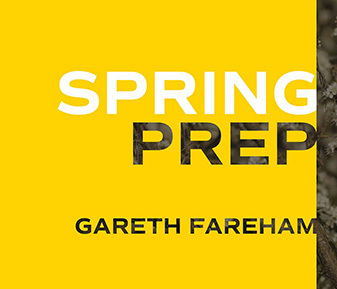 Q. You’ve been incredibly successful – but can you pull out three key reasons for this success? A. Dedication is a massive part of it. Every weekend I am fishing. 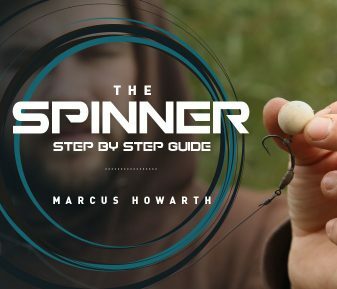 Good bait is one of the most important things in carp fishing too. Some of the lakes that I am fishing I am going through a 2 month blank. 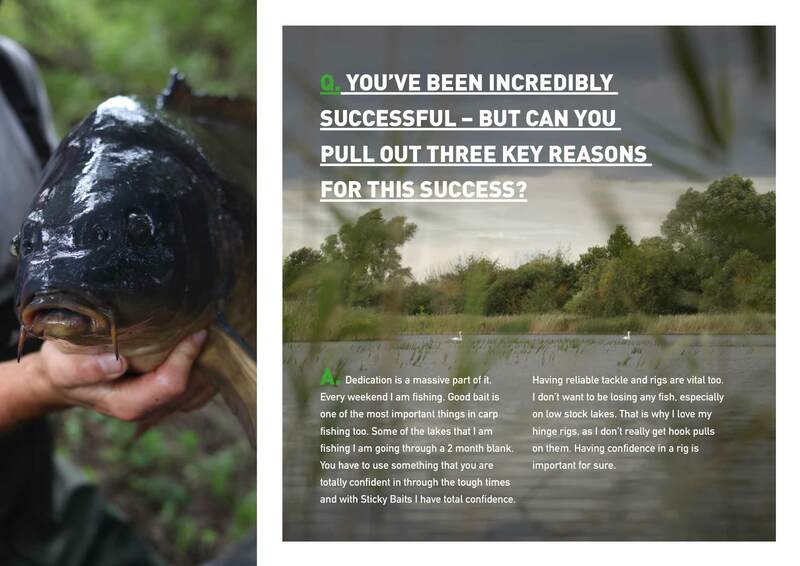 You have to use something that you are totally confident in through the tough times and with Sticky Baits I have total confidence. 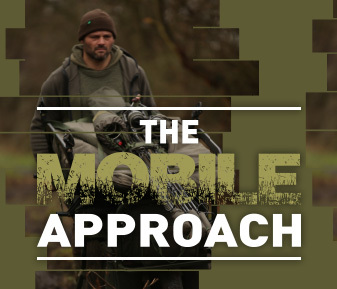 Having reliable tackle and rigs are vital too. 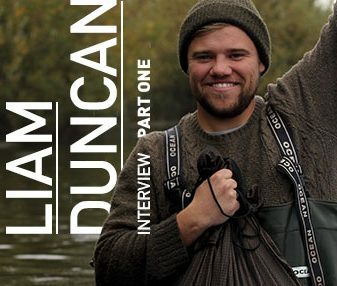 I don’t want to be losing any fish, especially on low stock lakes. That is why I love my hinge rigs, as I don’t really get hook pulls on them. Having confidence in a rig is important for sure. Q. 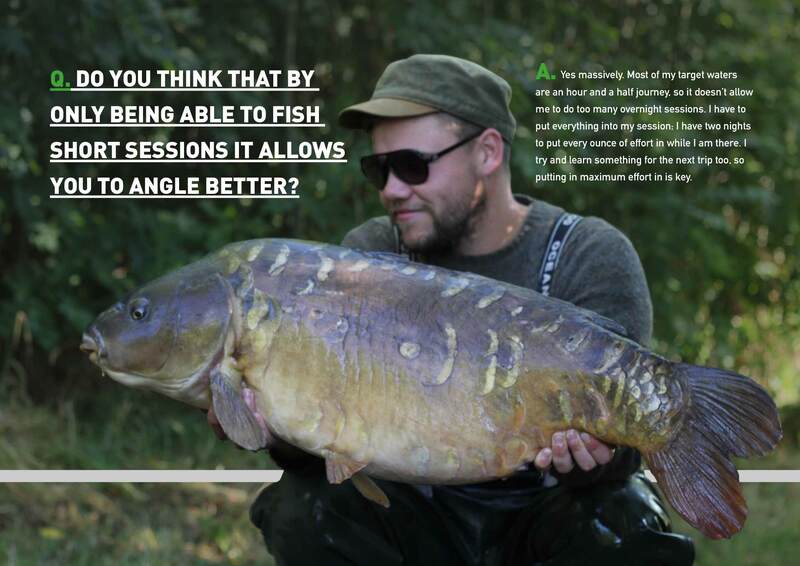 Do you think that by only being able to fish short sessions it allows you to angle better? A. Yes massively. Most of my target waters are an hour and a half journey, so it doesn’t allow me to do too many overnight sessions. I have to put everything into my session; I have two nights to put every ounce of effort in while I am there. I try and learn something for the next trip too, so putting in maximum effort in is key. Q. 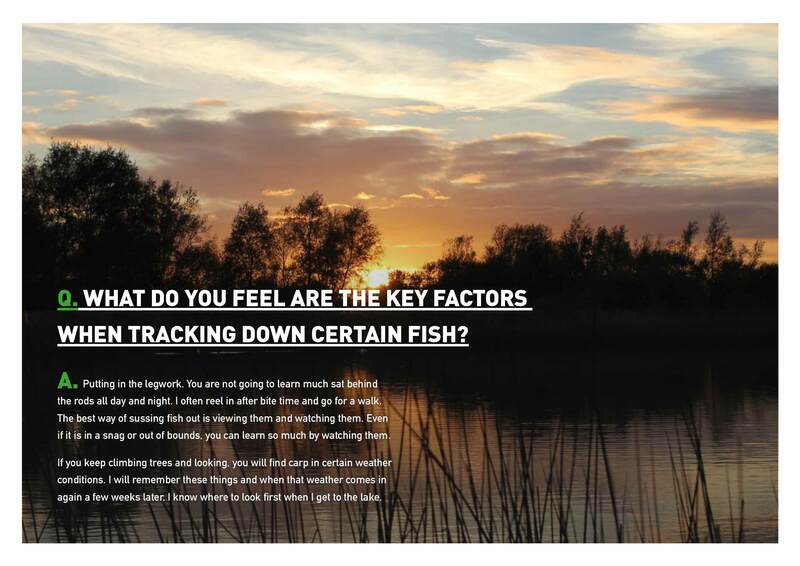 What do you feel are the key factors when tracking down certain fish? A. Putting in the legwork. You are not going to learn much sat behind the rods all day and night. I often reel in after bite time and go for a walk. The best way of sussing fish out is viewing them and watching them. Even if it is in a snag or out of bounds, you can learn so much by watching them. If you keep climbing trees and looking, you will find carp in certain weather conditions. I will remember these things and when that weather comes in again a few weeks later, I know where to look first when I get to the lake.